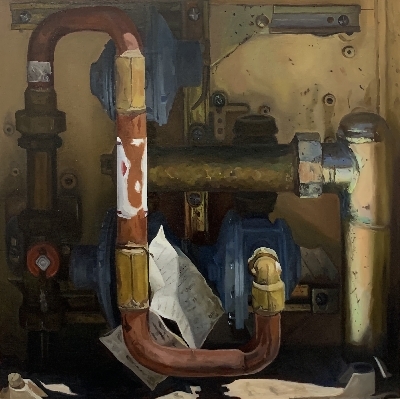 Jodi has earned an MFA from the New York Academy of Art and a BFA from Syracuse University. Her work has been shown at the Zhou B Art Center in Chicago, Sotheby's and the Flowers Gallery in New York as well as Fort Works Art in Texas. 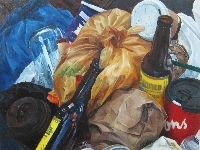 She currently paints at Reis Studios in Long Island City, New York. In my work, I am painting resilience and hope but not always through the depiction of the figure. 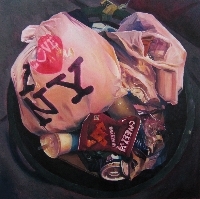 My oil paintings are realistic portrayals of the garbage, trash cans and drain pipes found as I walk around New York City. Finding the beauty in this is a way of conveying the idea that humans are often required to find something beautiful in a hard situation in order to keep going. The ability of a human being to do this is the essence of this resilience and hope. When I am painting the figure, I am trying to catch that moment of vulnerability, the second when that person thinks no one is looking. That vulnerability is the best part of a human being and where we can really connect to each other.